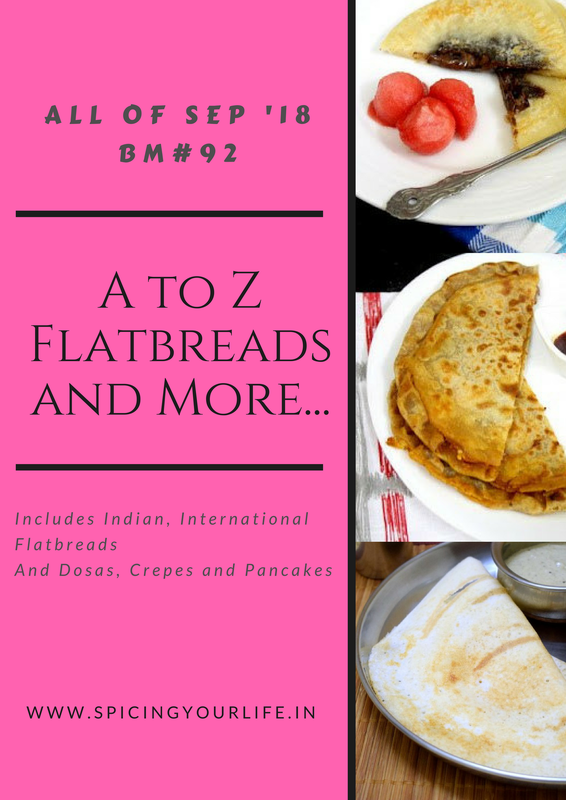 Gur ka Paratha Recipe is another sweet flat bread that I made for the A – Z flatbread series that we are doing this month. Whenever Dad talks about his childhood,he fondly remembers the sweet chapathi that his grandma would dish out for the kids. He tells us that the gooey jaggery pieces in the chapathi was a kids favorite and he used to love eating those. I never actually made jaggery parathas till now but would keep telling myself to make it one day soon. Then when I was looking for recipes to post for this series, this one popped up and I looked up the net to see if there is actually any such dish. And there it was!Several versions actually. I choose Vaishali’s recipe as it had another special ingredient- Almond meal. This is the mega marathon and it does need a special ingredient right! So I made this recipe and all of us enjoyed it. Gur is jaggery in Hindi and these are a winter specialty made in many parts of North India. The pics didn’t turn out quite well the first time and neither the second time I made these. I hope one day I will come back to this post and update it with better pics. But I can vouch for the taste right now! Take the whole wheat flour,a little salt in a bowl and mix well. Add water little by little and knead well. Add a little oil and knead again to get a smooth non sticky dough and keep it aside till we make the filling. Take the almond meal and powdered jaggery in a bowl and mix well. Pinch out a golf sized ball of dough and flatten it a bit. Spread ghee and add a tablespoon of filling[forgot to click that pic] and being the edges together. Gently roll out into 4″ diameter paratha and cook on a heated tawa till golden brown spots appear on both sides. use ghee to cook the parathas. Gur ka paratha is ready to be served. A popular North Indian paratha with jaggery and almond meal filling. Gently roll out into 4" diameter paratha and cook on a heated tawa till golden brown spots appear on both sides. use ghee to cook the parathas. Excellent and healthy filling for Paratha PJ, i was looking for a coconut-jaggery filling and here you are with a different filling. Too good. Those parathas looks prefect to pack in a kid’s lunch box as well. Wow, wow, Wow! The filling with almond and jaggery sounds fantastic. This is one easy version of making poli. Looks absolutely delicious PJ. A sweet beginning for a sweet day. Lovely parathas to have in the morning instead of a savory one. Anyway gur is suppose to be pretty healthy, rich in iron. Such a healthy and delicious paratha. Love the unique and different filling of almond meal and jaggery. Bookmarking this for my sons tiffin’s. I searched so much to find some sweet flatbread in the international theme, but could not find much at all. I am big fan of sweet flatbread and the Indian cuisine is a great treasure for that. This looks so good and is perfect for my sweet loving palate. I love gur ka paratha. But after trying puran poli I prefer to make with lentils now. But I have grew up eating gur ka paratha at nani’s place. so flavorful and yummy.